Home>Blog>What to do with the Zambeza Seedkit? As with all new life forms, the first few days are the most sensitive. Cannabis seeds are no different and Zambeza has you covered with our very own Seedkit. A great start in life helps grow great cannabis! So you've done your research, you have most of the equipment you need and you've even trawled the seed banks for your favourite strain. Before you're met with tall, aromatic cannabis plants bearing large fruits, or in our case dense nuggets rich in THC goodness there is one vital stage. A stage that unless executed properly makes the rest of the journey null and void. Germination is where it all begins, giving your chosen seeds the start they need to reach their full potential. Not one to leave you in the lurch, Zambeza has that front covered too, with our very own Zambeza seed kit. This little beauty provides the perfect home for your seedlings, suitable for up to 20 cannabis seeds. 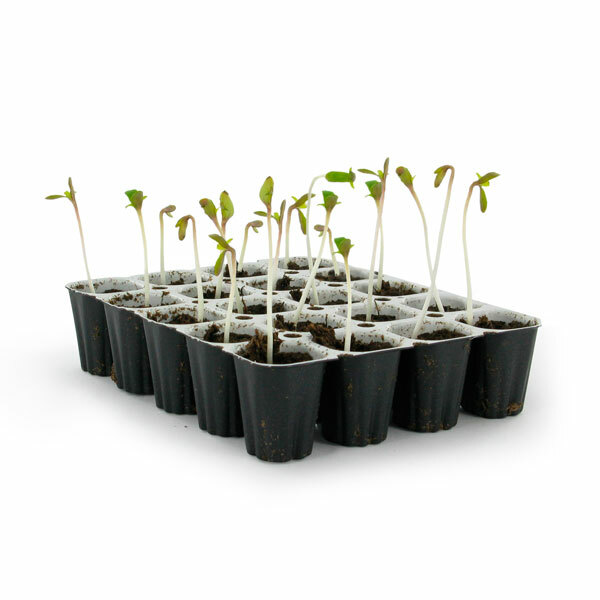 Even past the germination stage, your young plants can be left in their original grow pots and moved to a larger container or grow bed, those first days couldn't be any easier. Below we will cover what steps you need to take to get started and the best techniques for settling your seeds into their new, all be it temporary home. 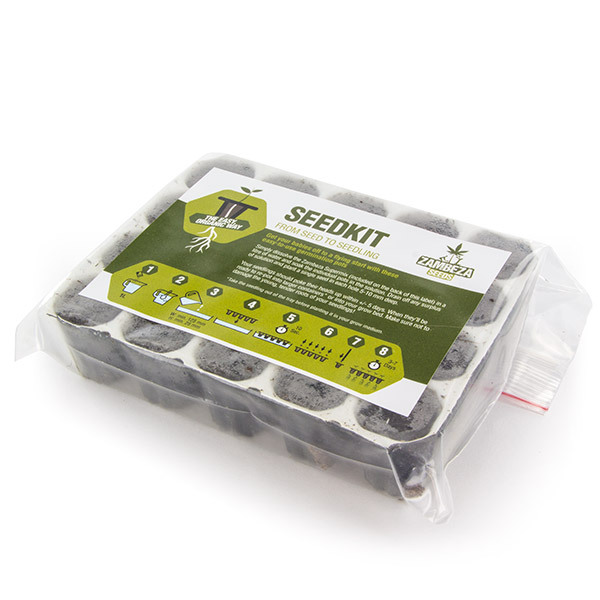 Not content with just giving you the seed kit, this product also includes Zambeza's own supermix, helping to maintain the balance between air and water in your seed pots. 1. Before you add the mixture place the seed pots into the propagator on a layer of the perlite. Using 1 litre of water, follow the instructions on the supermix packet to make up the mixture. 2. The set up of your propagator is key as too much water can do a lot of damage to your seeds. To prevent this it is best to make sure your perlite layer consists of a small water reservoir that isn't too close to the surface. 3. Irrigate the perlite and the pots using the supermix you prepared in step 1. As we've already mentioned Zambezas supermix helps to maintain the balance between air and water in the pot. By keeping the perlite sufficiently moistened, the pot will in turn also remain moist. Adequate moisture helps to keep the humidity high in the propagator, providing the right environment for your seeds. 4. Each pot needs a hole pierced in it and this is where your screwdriver or similar tool comes into play. Getting the right depth is key, somewhere between 5-10mm. Before you start piercing away, use the tape or cable tie to mark the required depth on your hole making tool. 5. Lining up the marking you made with the top of the pot will ensure all your holes are to the correct depth and your pots are nearly ready for their new occupants! 6. The final stage involves placing your chosen cannabis seeds in their new home. Using the same tool you used earlier to make the correct holes, you can insert the seeds at the same depth, lining up that marking once again. Now it's time to make yourself a cup of tea, put your feet up and wait! A few things worth noting; don't worry about which way up to put your seeds in their pots. They will naturally sort themselves out with the roots growing downwards to find the moisture they need and the seedlings making a dash for the top of the pot. Now whilst we don't expect you to drink the same cup of tea for several days, patience is an absolute virtue at this stage. Just like any newborn your seeds will be very delicate and as such are best left untouched once they have been planted. Other than maintaining sufficient moisture, less is more at this stage. Finally, the germination time of your seeds varies from strain to strain so don't panic if you don't see any signs of life after a couple of days. Some strains can take up to a week. Enjoy your new seedlings!